It’s one of your worst fears: Waking up in the middle of the night to the sounds of flooding coming from your basement, your living room, or your kitchen. Whether the flooding was caused by a natural disaster like heavy rainfall, a hurricane, or if it was caused by an overflowing toilet or a damaged water heater tank, an excess of water can wreak some serious havoc on your home. 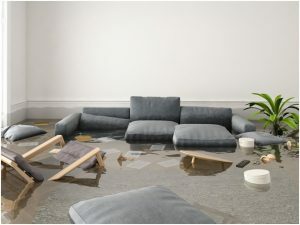 In addition to ruining your personal items like your furniture, artwork, and electronics, flooding inside your home can cause mold and mildew to build up, which can be hazardous to your health. When there’s flooding in your home, you’re going to need a water damage restoration company to come out immediately to assess the damage and repair it. But with dozens of local options and mixed reviews on social media review sites like Yelp, Google, and Facebook, it can be difficult to determine which company is going to be the right one to help you clean up this giant mess. Here are a few foolproof tips on how to choose a water damage restoration company—and why it’s so important to pick the right one. Water damage can unfortunately strike at any time, which is why you should always go with a company who prioritizes being there for their customers. Any good water damage restoration company knows that water damage doesn’t run on a 9–5 schedule—so why would you want to take a chance on a company that’s only open during certain hours? Is the Water Damage Restoration Company Bonded and Insured? Your neighbor may have a friend who does some water damage restoration work, but unless their company is bonded and insured, you need to stay far away. Bonding protects you in case the contractor doesn’t complete the job or doesn’t pay for the necessary permits. As for licensing, states typically require specific licenses for certain kinds of jobs like a plumber, an electrician, etc. It’s crucial for your water damage restoration company to have liability insurance so that they will be able to cover any contractor-caused damage that occurs on your property. Both licenses and bonding are there to protect you, the consumer, from having devastating financial consequences. When you’re hiring a company to take care of your home after it’s been damaged, you want to ensure that your home is in capable hands. While every company has to start somewhere, it’s always better to go with companies who have years of experience under their belts—but who also are in tune with the changing technologies of water damage restoration in order to make sure you’re receiving the best services possible. Do They Work Directly with Insurance? One of the worst parts about receiving damage on your home is having to deal with the insurance company. Even though you’ve sustained major damage in your home, you’ll still likely have to take the kids to school, go to work, and try to keep everything as normal as possible. Waiting on the phone to speak with your insurance representative isn’t something you have time for—which is why it’s always best to go with a company who can deal directly with insurance. This saves you time, hassle, and makes the repair process go more smoothly as you won’t have to be the middleman from insurer to repairer. Getting major water damage is likely going to be one of the worst days of your life as a homeowner. It’s not something that is fun or easy to deal with, and a company with terrible customer service is just going to make the situation worse. Always choose a company that’s going to go the extra mile, ensure that you’re comfortable with the work, and provide the service with a comforting smile. Kiwi Services is proud to offer water damage restoration services in your time of need. No matter what time of day or night, our expert technicians will be there to help clean up the mess. Call us today for a quote and to have a technician come out to your home immediately! I recently moved to an area that experiences flooding a lot, so I want to be prepared in case of a flood in my basement. You make a great point that you should choose a water damage restoration company that is available 24-hours for emergency services. This would definitely give me peace of mind in the future because they would be able to clean up the damage quickly before it spreads into other parts of the house. Also, I will make sure to choose a company that has been in business for many years because this shows that they have experience with flooding situations. You’re right on the money with the 24/7 openness making a HUGE difference. If a water damage restoration company isn’t open all the time, are they trustworthy? I think if they aren’t, that’s an immediate sign of a place not having enough knowledge or dedication to be worthy of use. You made a great point there! Thank you very much for this post, and God bless all of the families out there affected by flooding and other disasters, especially in light of the recent hurricane. I agree that using a site like Yelp or Google to find a damage restoration service is a smart idea. It would make sense to find someone who is qualified and experienced to help you out as well. My husband and I are looking for a contractor to help fix our flooded basement, so we’ll have to check what kind of online reviews they have first. Thank you for pointing gout that water damage can strike at anytime. I learned this last night when our basement flooded. I’m wanting to hire water damage services to help us get everything taken care of. I’ll have to look into finding the best services in my area. Seeing all these hurricanes on tv has had me wondering how flood restoration works. I think to make sure that the company is 24/7 would be good in case you have a basement flood late at night. Having an insured company would also be important to me so that I have peace of mind. My basement flooded during the last storm here, so thanks for sharing this. I like your point about choosing a water restoration service that works with your insurance provider. I’ll be sure to verify this so we don’t need to pay for it out-of-pocket. I like that you said that it’s best to hire a restoration company that has many years of experience to make sure that they have the capabilities to help you. My mother needs the help of a water damage restoration company. She said that she’d like to have peace of mind that her house is going to be livable again. This is why she’s looking for a water damage restoration company that has a successful record of completing water damage restoration works in the past. My husband and I came home from a vacation to find our basement was severely damaged from a water leak. We are wanting to hire a water restoration company as soon as possible to get our basement fixed. Thank you for suggesting that I should make sure and find a company with experience since they will be working with my home. I’ll have to do some research and find the best restoration services in my area. These are some pretty fantastic questions, especially the one about experience. After all, you will want to make sure that the restoration contractor has a decent amount of experience with helping homes recover from this kind of damage. That way you can more easily rely on them to help you bounce back from the water damage in your own home. A good water damage restoration company should specialize in water and fire damage repair and mold remediation. A general contractor with a shop vac just won’t do a thorough job in cleaning flooding from a home. Thanks for the tips! I thought it was interesting how the article talked about how you should choose a water damage restoration company that is willing to go the extra mile and ensure that you’re comfortable with the work. My brother lives in a city that just recently had a massive rainstorm that completely flooded his basement, so he has been looking for a company to come and repair the damage that all of the excess water caused. He would be much more comfortable hiring a company that has his best interests in mind as well as offers great service. I like that you suggested choosing a water damage restoration contractor that has been in service for years to make sure that they are capable of helping you. My parents need the help of a water damage restoration contractor. Their house got flooded when one of the plumbing pipes in their kitchen broke down. What they want is to restore the beauty of their house, so I’ll share this with them. You have done a great job in this post because you have provided us enough knowledge that how to choose the right water damage restoration company. I really thankful for you and your blog. Thanks for sharing this. I hadn’t thought about how we should check to see that the water damage company we choose are available 24/7 or at least when we need them. I’ve had a few leaks in my roof and I’ve had to use a bucket to keep the water off the floor but it’s time to repair it and I didn’t know who to call. Thank you for the tips on what to look for when hiring a water damage service, I’ll make sure to keep these tips in mind! I like the tip that you gave to choose to find a restoration service that has a good amount of experience in your field of need. My wife and I have been talking about finding a contractor who could fix our water damage from when our sprinkler line broke, and it would be important for us to know that we can find one who we could trust in. If we choose to find a restoration service, I will be sure to look for one who has a good amount of experience. I like that you pointed out that it’s best to hire a water damage restoration company that’s experienced to make sure that your house is going to be capable hands. My husband and I want to have our house restored after getting damaged due to flooding. One of the water pipes in the kitchen was accidentally damaged by my husband while he was fixing something. The water pipe leaked nonstop water. Since we want to make sure that our house is going to be restored in the best possible way, we’ll do all your tips.